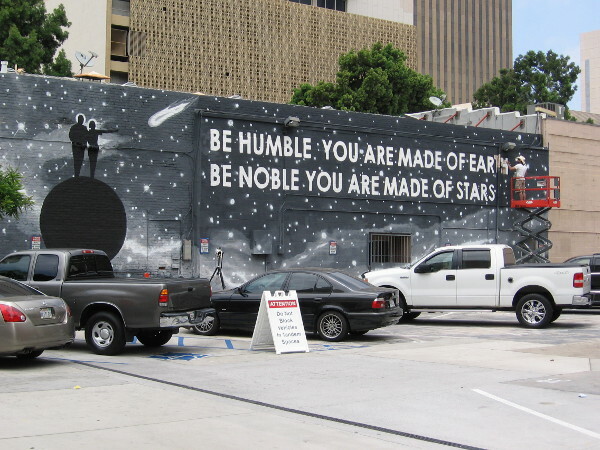 New mural in San Diego extols humility, nobility. – Cool San Diego Sights! New mural in San Diego extols humility, nobility. 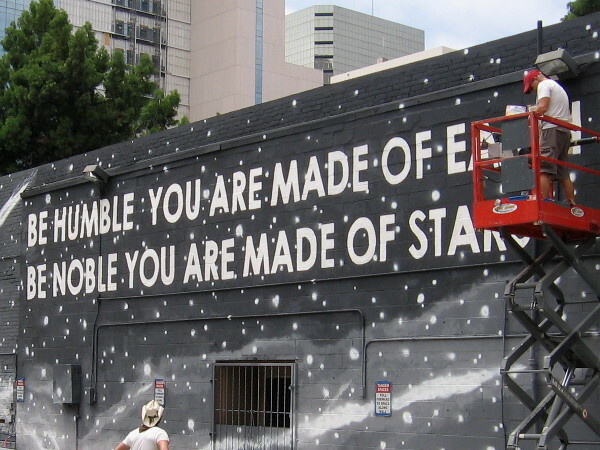 A new mural in downtown San Diego contains great wisdom, extolling two human values. Be humble. Be noble. A new street mural in downtown San Diego is being completed even as I post this! It’s being painted on a large parking lot wall just south of C Street, between Front Street and 1st Avenue. Check it out! The artist, Trek Thunder Kelly, who operates out of Venice Beach, California, is known for creating unique designs that mix oddly contrasting messages and images. The cool mural that he’s working on at this very moment is sponsored by the internet retail company Zappos, and it extols one of their stated core values: humility. I couldn’t help but notice the quote highlights another important human virtue: nobility. Be humble. You are made of earth. Be noble. You are made of stars. These powerful true words come from a Serbian proverb. When I spoke to Trek, it sounded like he’d paint some of the stars with glow-in-the-dark phosphorescent paint. At this point he has a limited supply, so it will have to be artistically applied. I can’t wait to see the completed artwork! Be humble. You are made of earth. Be noble. You are made of stars. To read a few philosophical short stories, click Short Stories by Richard. A beautiful piece of wisdom. Thanks for sharing. Pingback: SMILE, you’re in San Diego! – Cool San Diego Sights! Previous Previous post: This is what love is really about. Next Next post: Signs the 2016 MLB All-Star Game is almost here!